What is feline viral rhinotracheitis? Feline Viral Rhinotracheitis (FVR) is an infectious disease caused by feline herpesvirus type-1. As with other herpes viruses, the virus is very species specific, and is only known to cause infections in domestic and wild cats. The virus can infect cats of all ages. Feline Viral Rhinotracheitis is a major cause of upper respiratory disease in cats, and is the most common cause of conjunctivitis (inflammation of the tissues surrounding the eye, especially the lining of the lids and the third eyelid). How does a cat become infected with feline herpesvirus? "A cat becomes infected with this virus by direct contact with virus particles." A cat becomes infected with this virus by direct contact with virus particles. The virus is excreted in saliva and in discharges from the eyes and nose of an infected cat. Therefore, an infection occurs when a susceptible cat comes into direct contact with an infected cat, or comes into contact with inanimate objects (called 'fomites') that have been contaminated with viral particles. How long is a cat infectious after getting the virus? Once a cat is infected with FVR, there is usually a 2-5 day incubation period before it shows symptoms of disease. The cat can infect other cats during this incubation period. In most cases, once symptoms appear the active infection will last about 10-20 days. All cats that have been infected with FVR will become carriers of this virus; most carriers will be latent, meaning that the virus will survive in an inactive form within the cat's body. Stress will cause the virus to become reactivated, and if the virus becomes reactivated, the cat will again be infectious. In the majority of cases, the cat will show symptoms of a respiratory infection when the virus is reactivated. However, not all cats with a reactivated feline viral rhinotracheitis infection will show symptoms of disease. All cats that are actively shedding virus present a risk to other cats. How long can the virus live in the environment? When saliva or other discharges from an infected cat contaminate the environment, the virus can survive in the material as long as it stays moist. Fortunately the secretions usually dry up in a fairly short period of time, and once the secretion dries up the virus will die. Viral particles that get onto hands or other skin surfaces usually remain infective for about half an hour, while contaminated 'fomites' such as food or water bowls, kitty litter boxes, blankets, cleaning cloths, and cat toys will be infective as long as the secretions on them remain moist - under normal conditions, the secretions will dry up in a few hours. How can the virus be killed? The virus is readily killed in the environment by disinfectants, as long as the disinfectant contacts all contaminated surfaces. A bleach solution (1 part regular bleach to 32 parts water) is an effective disinfectant for surface disinfection or for use on objects that can be bleached. Contaminated objects should be soaked in bleach solution for a minimum of 5 minutes. Blankets or toys can also be disinfected by regular machine washing using hot water and detergent. Objects that cannot be bleached may be decontaminated by thorough washing with plenty of soap and water. Upholstered furniture may be decontaminated with upholstery shampoo, although in most cases furniture only serves as a source of virus for a short period of time after being contaminated by an infected cat. After touching an infected cat, hands can be sanitized by washing with soap and water (making sure to clean under the fingernails with a nail brush), followed by application of an alcohol-based hand sanitizer. Which cats are most at risk for a feline viral rhinotracheitis infection? All cats can become infected with FVR infections, but infection tends to be more severe in young animals or animals that have another chronic disease. Kittens born to a cat that is carrying a latent FVR infection may become infected after birth. In these kittens, symptoms usually develop several weeks after birth, and the infection can be very serious. What are the symptoms of a feline viral rhinotracheitis infection? "The virus may also cause keratitis...."
The typical symptoms of FVR involve the nose, throat and eyes, and include sneezing, nasal congestion, conjunctivitis (inflammation of the tissues that line the eyelids and surround the eyes), excessive blinking, and discharges from the eyes and nose that range from clear and watery to thick and purulent (containing pus). The virus may also cause keratitis, or inflammation and infection of the cornea, leading to corneal ulcers (see illustration). In chronic or severe infections, the keratitis can lead to corneal scarring or chronic 'dry eye' (keratoconjunctivitis sicca or KCS). Other non-specific symptoms may include fever, lethargy, anorexia or poor appetite, and enlarged lymph nodes. How is this infection diagnosed? Specific identification of FVR virus particles may be made by collecting samples of cells and discharges from the nose, eyes or back of the throat. Identification of feline herpesvirus DNA by polymerase chain reaction amplification (PCR testing) is the most sensitive test available for diagnosing infection by FHV-1. Unfortunately, if the virus is in a latent state (the patient is not showing clinical signs), diagnostic testing is usually not rewarding. What is the treatment for this infection? Cats with an uncomplicated infection caused by feline viral rhinotracheitis will usually be treated symptomatically. Treatment will be determined by the specific clinical signs and problems that your cat is showing. Conjunctivitis and keratitis may be treated with topical eye medications. It is extremely important to treat corneal ulcers aggressively in order to prevent permanent damage to the eyes. 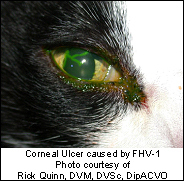 Cats with recurrent FVR conjunctivitis infections will often require treatment with antiviral ophthalmic drops (see our handout on Conjunctivitis - Feline Herpes Viral). Some cats may respond to supplementation with L-lysine, an amino acid that may help prevent the replication of the FVR virus, thus decreasing the amount of viral particles that are shed during an infection. Although viral infections like FVR are not directly treated by the use of antibacterial drugs, broad spectrum antibacterial drugs are often prescribed in an effort to prevent secondary bacterial infections from complicating the disease, particularly in kittens. Cats with nasal or airway congestion may benefit from increased environmental humidification, such as being taken into a steamy bathroom for 10-15 minutes several times per day. To minimize irritation from discharges, it is often helpful to wipe them away from the cat's face or eyes with a moist tissue. Since cats with a respiratory infection will have a decreased sense of smell, they often have a decreased appetite - feeding a highly palatable canned food may help improve their appetite. In some cases, an appetite stimulant may be prescribed. If a cat is dehydrated, depressed, or has a severe case of illness, your veterinarian will recommend hospitalization for more intensive treatment, including intravenous fluids and other supportive treatments. Are other cats in the household at risk of infection? A cat that has an acute feline viral rhinotracheitis infection will be infective to other cats during the incubation period and for up to 3 weeks after developing symptoms. A cat that is a carrier may always be infective to other cats. The risk of infection increases in cats that are unvaccinated, are young, or have chronic underlying problems. Adult cats that have been adequately vaccinated will likely only develop a mild case of illness, which may resolve without treatment. "A cat that has an acute feline viral rhinotracheitis infection will be infective to other cats..."
Affected cats must be isolated from other cats to avoid further spread of disease. It is always prudent to isolate any new cat from the other cats in your household for at least 1-2 weeks to minimize transmission of any infectious diseases. The upper respiratory infection that is caused by feline viral rhinotracheitis is species specific, and is only infectious to other cats. However, upper respiratory infections in cats can be caused by or complicated by bacterial infections, some of which might be zoonotic, or contagious to humans. If you follow good hygiene practices including proper hand washing after handling any cat, you will minimize the chance that you can get an illness from this or any other infectious disease. It would be prudent to consult your family physician if anyone in your family develops signs of a respiratory infection if your cat is ill. The standard 'core' vaccines that are given to cats include a vaccine against feline viral rhinotracheitis. The FVR vaccine will not completely prevent an infection from occurring if your cat is exposed to the virus, but it will significantly reduce the severity of the infection and will shorten the length of the illness. Solid immunity to these viruses is not long term, and may be overcome by exposure to a high dose of virus. Therefore, the FVR vaccine needs to be boostered on a regular basis - your veterinarian will advise you on the recommended booster schedule for your individual cat, based on its lifestyle and risk of disease. "The standard 'core' vaccines that are given to cats include a vaccine against feline viral rhinotracheitis." 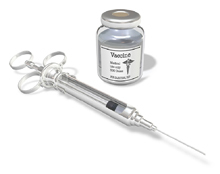 A cat that is a carrier of FVR may benefit from periodic boosters with the intranasal herpes and calicivirus vaccine (up to 2-3 times per year), which may stimulate local immunity against reactivation of the virus, thus decreasing the likelihood of recurrent infection and of viral shedding. . Susceptible cats can get an infection by direct contact with another infected cat or by environmental exposure to objects such as brushes, food bowls, litter boxes, cat toys, or blankets that have been contaminated with infectious secretions. Boarding facilities, humane societies, animal shelters, and cat shows are all places where susceptible cats can be readily exposed to these infectious diseases. If you plan on boarding or showing your cat, consult your veterinarian about the need for a booster vaccine at least two weeks before the planned event. 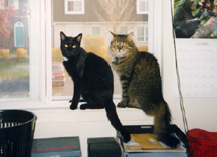 Preventing direct contact between your cat and other cats will greatly minimize the chance that your cat will pick up an infection, while following good sanitation and hygiene practices, such as washing your hands thoroughly before and after petting another cat will further reduce the likelihood of disease spread between cats. If your cat has had an FVR infection, you should keep the cat indoors to prevent spread of this infection to other cats in your neighborhood. What is the prognosis for a cat diagnosed with feline viral rhinotracheitis? There is no cure for herpesvirus infections. The therapeutic goal is to reduce the frequency and severity of recurrences. Most cats respond well to medical management of the condition and lead normal lives. Minimizing the chance of infection, feeding a premium diet, supplementing the diet with l-lysine daily, reducing stressful situations and following an appropriate vaccination schedule are your cat's best defense against this disease.